The date was Sunday, April 14, 1968. Easter Sunday! Some two thousand people had squeezed into New York City's Hotel New Yorker's largest ballroom, while other hundreds on the sidewalks were being turned away by friendly police and firemen. And who could blame the lucky ones inside for forgetting for a moment that the ballroom had been converted into a temporary church, when they burst into spontaneous applause at Father Gommar A. De Pauw's electrifying announcement that before the end of the summer the Catholic Traditionalist Movement would open its own church on Long Island! At least where the loyal Roman Catholics of metropolitan New York were concerned, the time of the C.T.M. 's founder's program of "Have portable alter, will travel" would be over. 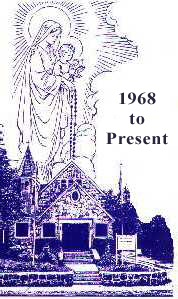 And so it was that on June 23, 1968, the third Sunday after Pentecost, a dilapidated former Ukrainian Orthodox church appeared on the scene as a completely renovated and highly attractive little Roman Catholic house of worship, the only one in the world at that time were the traditional Latin Roman Catholic mass would henceforth be publicly kept alive. Placed under the protection of God's Mother, it would be known as the C.T.M. 's Headquarters AVE MARIA CHAPEL. And here we are, thirty years later, June 23, 1998. As we look back to June 23, 1968, we remember that some said it COULDN'T be done; others said it SHOULDN'T be done; still others said it WOULDN'T be done. Yet here we stand at the thirty year mark, to prove that it HAS BEEN done! The facts of these thirty years speak for themselves. There are first the MATERIAL accomplishments which continue to be the daily amazement-and envy-of the Establishment whose poor prophets predicted our bankruptcy in less than one year, but who now, thirty years later, are wondering aloud how we did it and continue to do it, especially when compared with their own institutions which are getting deeper and deeper in the red. Our chapel, our downstairs chapel extension, our other buildings and our grounds are all in excellent condition, and both regular members and visitors continue to be provided all -year-round with the best heating, air conditioning, sound, and closed circuit television systems available on the market. And all this, while keeping both the Catholic Traditionalist Movement's and the Ave Maria Chapel's financial record intact, so as to make it possible for us to answer visitors who tell us how beautiful and well organized things are at Ave Maria: "Beautiful, indeed, and all paid for, besides." But more important than anything material or financial are the SPIRITUAL accomplishments this little chapel has produced. The invisible ones are only known to God and to the persons who experienced them through the true sacrifice of the Mass, the true Sacraments, and the true Roman Catholic instructions, a triple treasure of which-as history will some day record-Westbury's little spiritual oasis was the only public dispenser in the world during the Church's darkest hour. The visible spiritual accomplishments are there, of course, for all to see: the preservation not only of the unchanged traditional Latin Mass, but of every other tradition of the Roman Catholic Church as well: observance of Sunday, and Sunday only, as the Lord's Day, observance of Fridays, Ember days, vigils and fastdays, and every holyday and feastday of the traditional calendar; Gregorian Chant High Masses and Benedictions; Christmas Midnight mass, Candlemas, St. Blaise's blessing, Ash Wednesday, Lenten devotions and Stations of the Cross, Palm Sunday Procession and Holy Week services, First Friday and First Saturday Mass and devotions, May procession and Crowning of the Blessed Virgin Mary with scapular dedication of the children, Forty Hours Devotion, Corpus Christi procession, every and each spiritual need of the Roman Catholic faithful abundantly fulfilled "from cradle to grave." With each and every one of us, both young and old, having received so many spiritual benefits from this "oasis of Catholic Faith in a desert of conciliarist decay," we thank Almighty God and His Blessed Mother for the privilege of being part of the Catholic Traditionalist Movement's Ave Maria Chapel and all it symbolizes, and ask His continued blessings on our Movement and our chapel's future endeavors. And to Father Gommar A. De Pauw whom God selected to do His work for us, our loyal gratitude and prayerful "Ad multos annos!" "Catholics who remain faithful to TRADITION even if they are reduced to but a handful, they are the True Church of Jesus Christ"
© 1965 Catholic Traditionalist Movement Inc.